The BattleStar Galactica prequel will not be coming back for a second season, after failing to find its audience. Syfy has pulled the plug on Caprica, the spin-off prequel to the re-imagined BattleStar Galactica. It has also plucked the remaining five episodes from the regular schedule, with plans to show them at an as yet unannounced time in the first quarter of 2011. 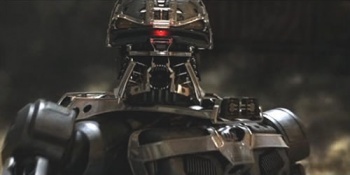 Set 58 years before the start of BSG, Caprica showed the creation of the original Cylons, and the events that led to the first war against them. In a statement, Syfy's executive VP of original programming Mark Stern said that he appreciated all the support from the fans, and that he was very proud of everyone who had worked on the show. Unfortunately, he said, despite being a high quality show, it didn't pull in enough viewers to make a second season viable. Syfy plans to release updated schedules with the new listings later on today. Obviously, it's sad to see a sci-fi show peter out so quickly, but as Caprica was a prequel to a show that had already had its entire run, at least fans won't be left hanging over how it ends. Admittedly, that's a small comfort, but it's better than nothing. There's also the upcoming pilot for BattleStar Galactica: Blood and Chrome, which is set before the main series, but after Caprica. The show is supposedly more in tune with the series' "space-opera roots," and will hopefully fare better with viewers.